Disclosure: I am an Etsy Affiliate and will earn a small commission if you click through any of the links below and place an order. I can’t believe how fast this month is going! It seems like we just had Easter, and now I’m on my way to the BlogPaws conference, and before you know it, it will be Mothers Day. 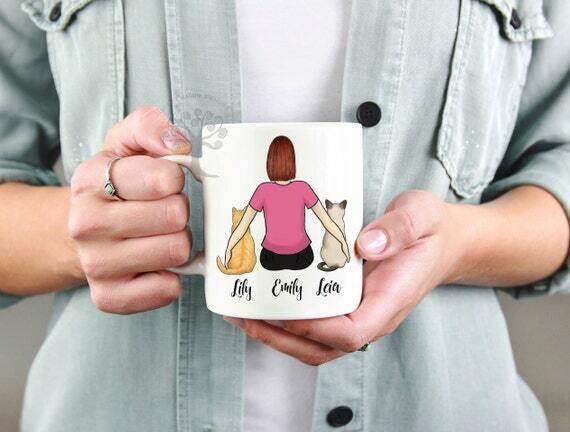 This year it is May 13, and I wanted to make sure to pick some Mothers Day gifts for cat lovers! I browsed through Etsy, and found lots of really cute items! Some of these Mothers Day gift suggestions are personalized and they may take longer to get to you. So if you like any of those, I suggest ordering them soon! 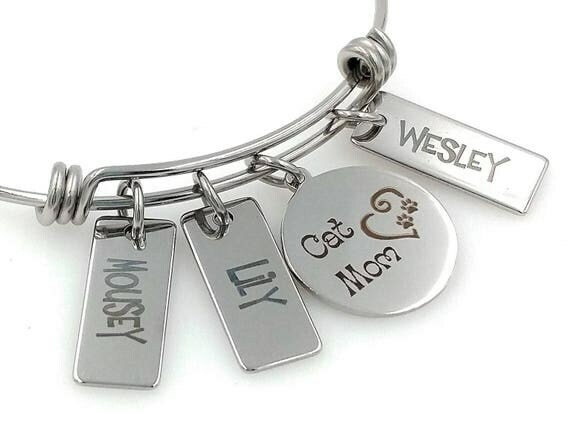 You can add up to six cat names on this laser engraved bangle bracelet! The name tags are stainless steel and finished with a high polish on both sides. The bangle is made from a durable thick gauge wire and is about 7-1/4″, expandable to 8″. It’s simple and pretty and heartfelt. Do you know a human with two kitties? She would love this ceramic mug! Not only can you add all three names, you can change the human’s hair color and style, and the kitties’ fur. Plus there are two sizes, 11 oz. and 15 oz. The design is printed, not a sticker or vinyl. This sweet necklace is fully customizable, with a variety of lengths, choice of birthstone color, and an initial laser engraved on the little heart. It comes from the U.K., so if you live outside of there, it may take a little longer to get to you! Who says thumb tacks can’t have personality? These little cat faces are adorable, and would make a thoughtful small gift for a special cat lover. If your cat loving friend enjoys an adult beverage at the end of a hard day scooping litter boxes and playing with her kitties, here’s the Mothers Day gift for her! The design is dishwasher-safe permanent vinyl, and comes in your choice of metallic gold, silver or bronze. This super soft gray sweatshirt has a raw edge neckline and is made from organic cotton, recycled poly and rayon. The sweet design is hand printed with each order. You have the option of really nice giftwrapping too. Isn’t this design fun? The polyester tote itself comes in three different sizes, and is built to last, with black cotton handles and black lining. 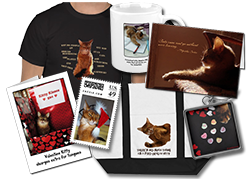 I hope you liked this year’s Mothers Day cat lover gifts! What a great selection of ideas for Moms! Thanks Summer………….I need to get going finding something for my Mom soon – time’s flying by! I am furry tempted! By all of those! 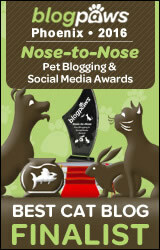 Enjoy the doings at Blog Paws! Those are such great gift ideas, Summer! Our favorite was actually the very first item — the mug! It’s neat that it can be personalized! your gifts look smart and adorable. Have a great conference. Be kind to Miss Binga! The thumb tacks are adorable. Too bad we don’t have a bulletin board. I’d be happy with any one of these items for Mother’s Day! Great choices. We found some gift ideas from this list so thank you, Summer! 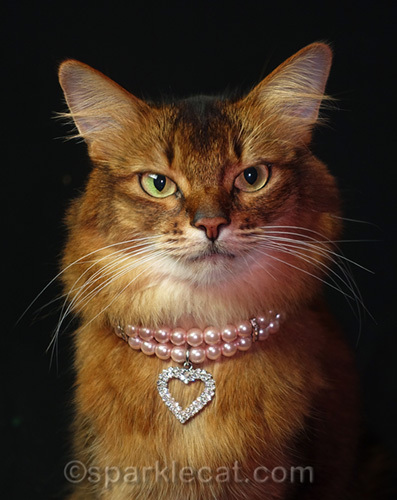 You look pretty in your fancy necklace too! Those are all great gifts for a kitty mom. I think of all of these the kitty cat thumb tacks are my faves 🙂 I am super choosy when it comes to cat stuff……(or should I say super STRANGE when it comes to cat stuff?) I tend to not like mainstream items. Those are super cool, Summer! Not shopping at the moment but I ‘favorited” the wine glasses and the tote bag for future b’day gifts! There are some great gifts there. We especially like the mug! Love the Mama cat and her kitten! Also, the human woman and her two kitties! It’s fun that we have so much to choose from these days! These are adorable! Great picks! The mom would love to get any of these, Summer. Great picks! Thumb tacks are adorable! I gotta make mommy go look! Those are some darn cute goodies! Mom luffs those thumb tacks especially. Did you ever decide which party dress to take? Ohhhh that mermaid tote and the kitty tacks are very unique!! Summer yes you may use ‘older than dirt’ on Binga………..but be prepared to high tail it just in case she takes offense.